ZMH286 Gulf Harbour Radio reporting weather and sailing conditions and communicating with yachts sailing in the South Pacific. Broadcast at 1915 UTC Monday to Saturday, from May to November. Transmitted from Whangaparaoa, New Zealand, kw unknown. In association with Yachts in Transit, http://www.yit.nz/gulf-harbour-radio. There are some deep fades during the transmission. Received in Sydney, Australia, with a Sangean ATS-909X and PK's mag loop antenna. Live recording of Radio Reloj (CMBD), Havana, Cuba, on 30 August 2015 beginning at about 15:55 UTC on a frequency of 950 kHz. 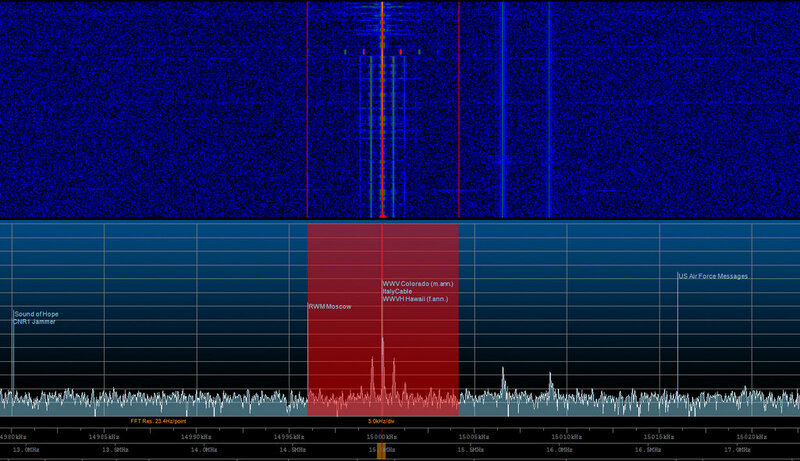 The signal originates from a 10 kW transmitter at Arroyo Arenas / San Augustin, near Havana, using the Centros Transmisores de Ondas Medias 1 (CTOM1) non-directional antenna facility. The recording, in Spanish, is a typical Radio Reloj broadcast with two announcers alternately reading news bulletins accompanied by time signals. The announcers identify the station and verbally give the local time each minute. In addition to the verbal station identification, each minute either the letters RR in morse code (using 1800 Hz tones) are transmitted or five-note chimes (D4, G4, B4, D5, B4) are played. The chimes sound like those of a dinner chime or even some door bells and are reminiscent of the U.S. National Broadcasting Company (NBC) chimes. On a couple of occasions in this recording, during a particular minute, neither the morse code nor the chimes are used and sometimes, during a particular minute, both are used. In this recording, we can also hear at some minutes pairs of tones being played going up and down the scale as news headlines are read. On other occasions, three- and four-note chimes in various sequences have been heard (perhaps at the announcers' whim). Different tones identify each second, minute, and five-minute epochs. Based on measurements, each second is marked with a "seconds tick" consisting 10 cycles of a 1000 Hz tone (0.01 seconds duration). Minutes, except for multiples of 5 minutes, are marked by 172 cycles of a 1000 Hz tone (0.172 seconds duration). Every 5 minutes, the marker is extended to 672 cycles of a 1000 Hz tone (0.672 seconds duration). The minute and 5-minute markers are preceded by 5 cycles of a 1000 Hz tone, followed by 0.013 seconds of silence. The time signals in this particular broadcast were well within one second of the time given by a computer's clock synchronized to the U.S. time standard using Network Time Protocol. The broadcast was received on a Tecsun PL-880 receiver with its built-in loop antenna in Key West, Florida, using an RF bandwidth of 5 kHz. The receiver was oriented for maximum signal strength. Signal quality is generally good. However, there are repeated static crashes (QRN) from thunderstorms in the region. Richard also notes that he was located in Key West, Florida, using a "Tecsun PL-880 receiver with built-in loop antenna using an RF bandwidth of 5 kHz. The receiver was oriented for maximum signal strength." I combined several audio files of some of the common time signal stations available back in 1981 and 1982 into one clip. These were made using a DX-302 which had poor image rejection and you can hear some stations behind WWV which shouldn't be there, such as RCI's interval signal at one point. Live recording of time signal station CHU, Canada, on 30 June 2015 beginning at exactly 23:55:00 UTC on a frequency of 7850 kHz. 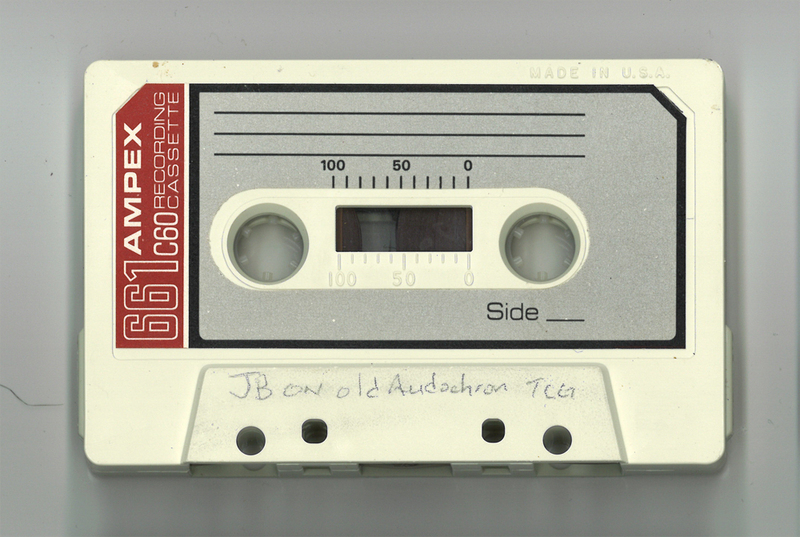 The recording last exactly 10 minutes and 1 second, ending at 0:10:00 UTC. A leap second occurs at 23:59:60 UTC. This can be noted by the 1 second of silence between the 5m:00s mark in the recording (23:59:60 UTC) and the 5m:01s mark (0:00:00 UTC) denoted by the start of the one-second-long tone. This is followed by 9 seconds of silence. Before the leap second, the forecast difference between UT1 and UTC (DUT1 = UT1 minus UTC) to a precision of one tenth of a second was -0.7 seconds. This is indicated by CHU by using a sequence of double tones at 9 seconds through 15 seconds after the start of each minute except for the minute beginning an hour. Following the leap second, DUT1 is +0.3 seconds, marked by double tones at 2 seconds through 4 seconds after the start of the minute, again, except for the minute beginning an hour. The strong CHU signal was received on a Tecsun PL-880 receiver with a Tecsun AN-03L 7-metre wire antenna in Hanwell, New Brunswick, Canada, in AM mode with 5 kHz RF filtering. There is some atmospheric noise (static). Yesterday, I posted a brief article about the leap second that occurred between 23:59:59 June 30, 2015 and 00:00:00 UTC July 01, 2015. I decided to record the leap second on as many shortwave time station frequencies as possible. The only viable options for me--based on time of day and my reception location--were the WWV frequencies 10, 15, 20, and 25 MHz, and CHU frequencies 7,850 and 14,670 kHz. Unfortunately, HF propagation was very poor yesterday, so the higher WWV frequencies--20 and 25 MHz--were completely inaudible, as was CHU on 14,670 kHz. There were numerous thunderstorms in our area, so static crashes were prevalent. Still, since this was a first attempt to record a "leap second," I didn't want to take any chances. 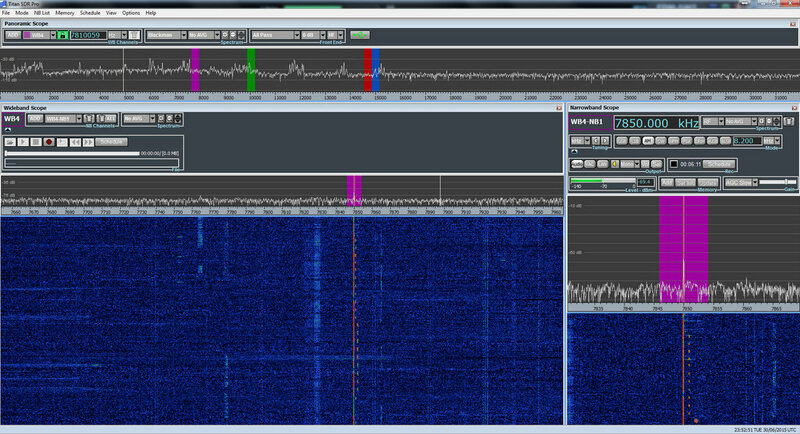 I had the Titan SDR Pro monitoring and recording two CHU and two WWV frequencies [screenshot], the Elad FDM-S2 recording WWV on 15 MHz [screenshot], and the WinRadio Excalibur on WWV's 10 MHz frequency, as well as recording the whole 31 meter band spectrum [screenshot]. The sign above WWV's primary 10 MHz transmitter (2014). All of the recordings start just before the announcement of 23:59 UTC. WWV added the extra second and higher tone, then continued with their top of the hour announcements, including a note about leap second (which begins after the 00:04 announcement). CHU's adjustment included a long second tone and period of silence. One interesting note about the 10 MHz WWV recording above: I believe I may be hearing BPM China in the background. I'm curious if anyone can confirm this because I don't know BPM's cadence/pattern well enough to ID it.